SYDNEY, Australia (CNN) -- Another round of international condemnation erupted Thursday over France's latest underground nuclear blast in the South Pacific. 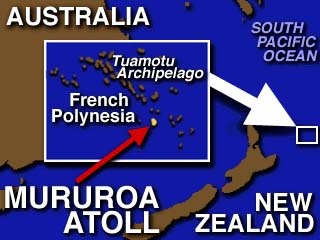 The French military said the explosion beneath Mururoa Atoll had a yield of less than 30 kilotons, which is weaker than previous tests. France has said that it may conduct as many as eight such tests, but the government hints that it is considering stopping at six. On Thursday, when Australia summoned French Charge d'Affaires Alain Mauroy to the Australian Foreign Affairs Department, he indicated that Wednesday's test was probably not the last. The blasts have so far been staged about a month apart since September. That means a six-test series could be finished before French President Jacques Chirac visits Washington on February 1. But Defense Minister Charles Millon has said there may be a seventh test in February. Whatever the number, it's still too many for opponents of the weapons testing. Protesters gathered outside the French embassy in Tokyo Thursday. 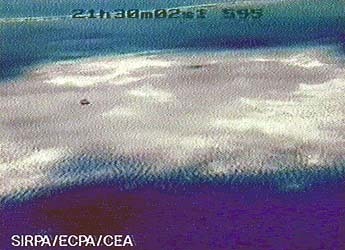 Japan, the only country to be attacked with nuclear weapons, has been especially critical of the tests. Japanese Prime Minister Tomiichi Murayama called on France to put an end to the tests, calling them "meaningless." That the blast was carried out so close to the holidays angered many inhabitants of the region. "They didn't want to have it over French Christmas," said acting Australian Foreign Minister Gordon Bilney. "But they are quite prepared to make this a New Year's present to the South Pacific." However, Mauroy denied any deliberate link between the timing of the explosion and the season of peace and good will. "I don't think it has anything to do with that," said Mauroy. "This date has been chosen for specific reasons and it happened today....It could have happened days ago." Press reports said the latest test was originally scheduled for December 22 but was delayed to keep it from coinciding with sensitive talks between the French government and labor unions over the recent three-week public strike which crippled the country. The South Pacific's strongest critic of the tests, New Zealand Prime Minister Jim Bolger, expressed his frustration yet again. The environmental group Greenpeace, which has actively tried to stop the tests, condemned Thursday's explosion as well. It said people around the world were hoping for a safe and peaceful New Year but French President Jacques Chirac "is instead guaranteeing one of continued nuclear weapons testing and a world filled with nuclear weapons." French officials said the latest test will help the country simulate nuclear tests on computer. France is expected to use that $3.1 billion computer simulation program, after it signs a Comprehensive Test Ban Treaty, expected by the end of next year.